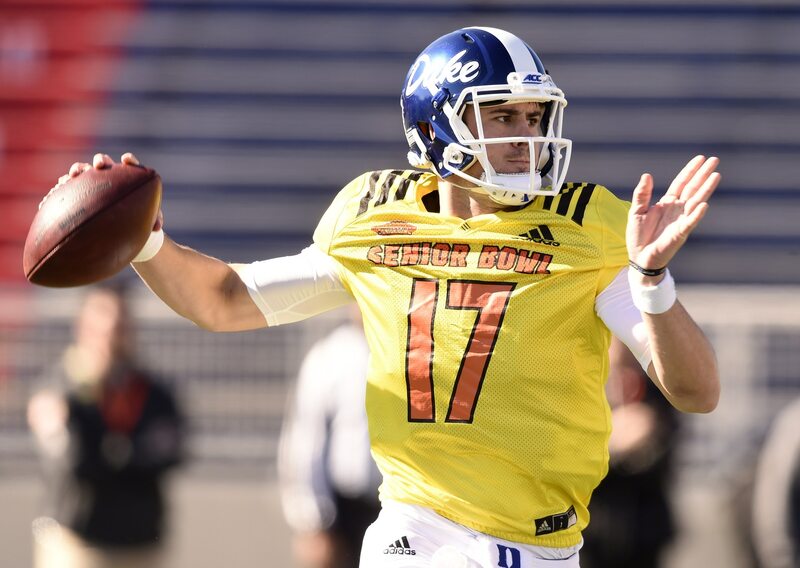 One of the biggest pre-draft opportunities out there, the 2019 Senior Bowl provided prospects with an amazing chance to improve their stock. Not everyone took advantage, but there were some very strong performances. These are the biggest standout players from the 2019 Senior Bowl. Armstead got some early action in with the South team and punched in the first touchdown of the game. Showing off outstanding vision and burst, the senior out of Temple carried the ball four times for 22 yards and the score on that opening possession. He would finish with 38 yards on eight carries. This strong showing capped off a really good week for Armstead, who showed out during practices as well. One of the guys who really made a name for himself all week during practice, Saunders showed up during the first quarter with a tremendous move inside to sack Will Grier. What a week for Khalen Saunders, the 320-pound DT who can do a backflip. Saunders actually missed the birth of his first daughter to attend the Senior Bowl. It was a conscious choice he and his fiancee made so he could stand out in this setting, and it really paid off. His backflip went viral (who doesn’t love to see a 320-pound man backflip?) but it was his play that opened eyes and should significantly improve his stock. This week provided a huge opportunity for Doss to make a name for himself. A lesser-known player from UC Davis, he flew way under the radar all throughout the 2018 college football season. Once he was on the field with some of the nation’s top NFL prospects, however, it didn’t take long for this receiver to stand out. Doss once again opened eyes with his performance during Saturday’s Senior Bowl game, catching four passes for 55 yards, including this gem. Doss will be drafted in April, that’s for sure — probably earlier than most think. And based on everything he’s shown this past week, he’ll stick on a roster. A fast riser who showed up big all week during practices, Omenihu was a dominating force during the game on Saturday. He showed up early in the game, putting pressure on Will Grier, posting a tackle for a loss, coming extremely close to a strip-sack and making is presence felt regularly in the first half. Then in the second half, Omehihu showed he’s never out of a play, no matter where he is on the field, forcing a fumble on a strip-sack of Jarrett Stidham. From start to finish, Omenihu was dominant on Saturday. Just a huge week for this pass rusher, whose stock is on the rise. One of the most impressive players at any position throughout the week of practices in Mobile, Risner provided scouts and coaches with some serious nasty — something they love to see in offensive linemen. Risner then up with an outstanding game on Saturday. He often held Montez Sweat (more on him in a moment) at bay in pass protection and was fluid and physical in the run game. He’s a versatile offensive lineman who can play multiple positions but who should really be a plug-and-play right tackle in the NFL. Every single day during the week as practices unfolded, scouts attending in Mobile raved about this edge specialist. "He was everything that we thought he was going to be, and more." Sweat showed up big once the game began, too. He continually proved he’s no one-trick pony, making tremendous plays in the run game while applying pressure against the pass. This young man has really cemented himself as a first-round talent and could go very early in April. A player who we’ve been high on since very early in the 2018 college football season, this week Isabella showed he’s more than just a highly productive receiver at a small school. His route-running and quickness were on display throughout the week during practices, and he wowed with his pure speed, too. During Saturday’s game, the North offense got going in the second half with Daniel Jones under center (more on him in a moment), and Isabella was a beneficiary. All told, this young man out of UMass totaled 93 yards and a touchdown on eight touches. He’s an intriguing player who will certainly have plenty of teams interested in him during the next few months. Another small-school prospect who came up huge this entire week, Adderley wowed scouts and made a case for himself to be taken very early in the draft. Earning three Raiders decals (handed out to players after making big plays), he was the only defender to do so. The third came late in the fourth quarter when he sealed the win for the North team by baiting Tyree Jackson into throwing a bad interception. Adderley was a defensive captain for Gruden’s squad and played like it on Saturday. The quarterback play on Saturday was quite honestly pretty pedestrian — if not much worse — until the third quarter. Jones was a part of that, as his pocket awareness was cringe-worthy and he struggled to see the field. After halftime, however, Jones got into a rhythm and started getting the North offense into gear. All told, the senior out of Duke threw for 110 yards and a touchdown while completing 8-of-11 passes. He also added a rushing score and was the catalyst for the North team pulling away in the second half.